A classically trained artist, Eleanor Grace Miller received her BA from Monmouth University, where she studied under Eleanore Mikus, a vanguard Minimalist, and Bernard Aptekar, one of the original SOHO Ten Downtown, and continued her studies at the National Academy School of Fine Arts. 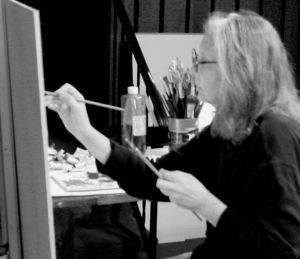 Miller has exhibited extensively throughout the East Coast, both in fine art galleries and corporate venues, and is the recipient of numerous awards, including Best of Show at the Museum of Fine Arts, Springfield, MA, the Anna Hyatt Huntington Award from the National Arts Club, and the Gamblin Artists Award from the Salmagundi Club. Her work is in both private and corporate collections. She is currently on the faculty at RoCA and the Pelham Art Center. Please visit www.eleanorgracemiller.com for more info.